New natural stone paving to form patio and pathways leading to a new garden hot tub that we installed and commissioned on a custom built decking. We also re-turfed the surrounding lawn. 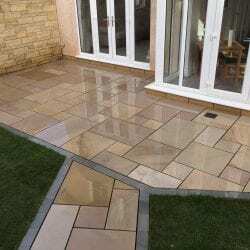 R&B Building Services (Skipton) Ltd can undertake all elements of garden design and construction using traditional materials.